Jacob was time out of sync, time more perfect than it had been. He was life the way it was supposed to be all those years ago. That’s what all the Returned were. The basis for the hit television series, Resurrection. Jason Mott lives in southeastern North Carolina. He has a BFA in Fiction and an MFA in Poetry, both from the University of North Carolina at Wilmington. His poetry and fiction has appeared in various journals such as Prick of the Spindle, The Thomas Wolfe Review, The Kakalak Anthology of Carolina Poets, Measure and Chautauqua. He was nominated for a 2009 Pushcart Prize award. He is the author of two poetry collections. The Returned is his first novel. 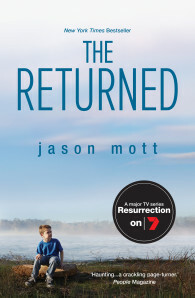 The Returned has also been optioned by Brad Pitt’s production company, Plan B, in association with Brillstein Entertainment and ABC.